Hargrave Chiropractic • Most Insurance Accepted! Call us today for your FREE laser consultation (60 dollar value)! Q: What is Laser or Light Therapy? A: Laser Therapy or “photobiomodulation”, is the use of specific wavelengths of light (red and near infrared) to create therapeutic effects. These effects include improved healing time, pain reduction, increased circulation and decreased swelling. Laser therapy is the therapeutic application of coherent, monochromatic light. Bio – “Life” stimulation and tissue regeneration are the first effects cited in much of the literature. How many therapies can make such a claim? Laser therapy adds energy to living systems. While we are able to explain many of its molecular and biochemical effects, it also adds energy at atomic and subatomic levels. When we understand these deeper effects, perhaps we may know much more about ourselves. Q: What is its history? A: The effects of red light on cellular function have been known since 1880 however the clinical benefits were only discovered by accident during laser safety tests in 1967. The first low-power lasers suitable for treating pain became available commercially in the late 1970’s and ever since then, laser therapy has been widely utilized in Europe by physical therapists, nurses and doctors. Now, after FDA approval in 2001, laser therapy is quickly gaining popularity in the USA. Q: Has effectiveness been demonstrated scientifically? A: Yes. There are thousands of published studies demonstrating the clinical effectiveness of laser therapy. Among these, there are more than one hundred rigorously controlled, scientific studies that document the effectiveness of laser for many clinical conditions. Q: What does laser therapy do, anyway??? 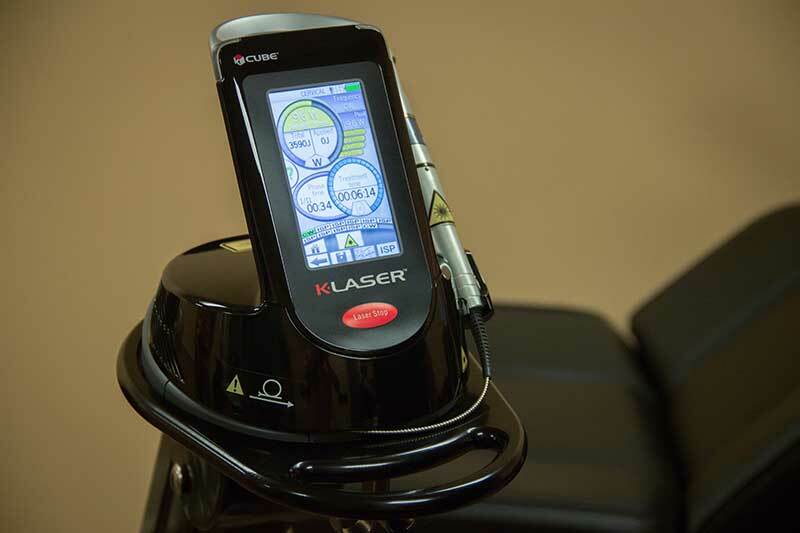 Q: What is the power of most laser therapy devices on the market? A: Low laser therapy devices are class III lasers whose powers range from 5 milliwatts to 500 milliwatts. The K-Cube 4 is a high-powered therapy device with power adjustable from 100 milliwatts to 15,000 milliwatts allowing for a wide range of treatment protocols. 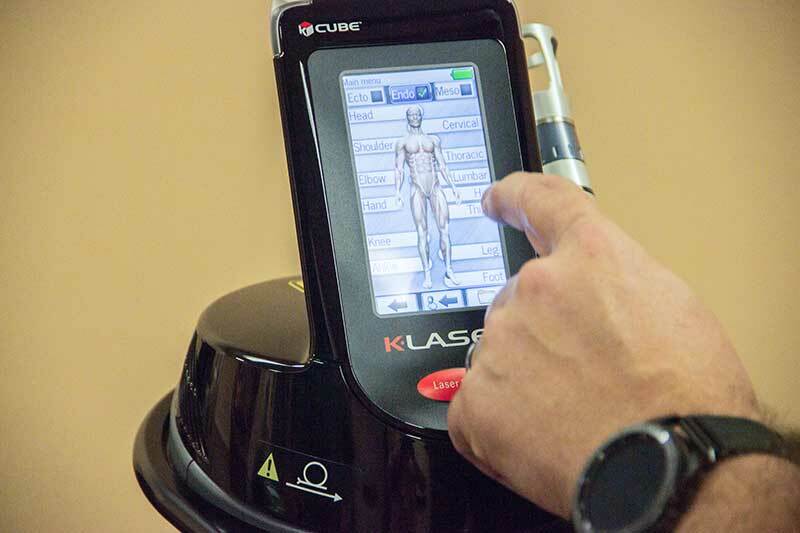 This power and penetration of the K-Laser system is not attainable with cold laser devices. Q: How many laser sessions are necessary? A: Usually ten to fifteen sessions are sufficient to achieve a treatment goal. However, many patients note improvement in their condition in just one or two sessions. These sessions may be scheduled at two to three times per week for short duration treatment, or once or twice per week with longer treatment protocols. Q: Why is Laser Therapy better than some other forms of treatment? A: It does not require the use of drugs or surgery, there are less side effects or risks, and it is quick and convenient. Studies have shown that it is equal to or more effective than other forms of physical therapy. Q: What does it feel like to get a laser therapy treatment? A: You really don’t feel too much. There may be a slight warming sensation since the laser uses an infrared wavelength. Or you might feel a little tingly sensation – some people think this is due to the increase in cellular energy output, or the increase in cell membrane permeability. Q: What about side effects, or other risks? A: Occasionally I have had a patient say there pain was slightly increased after a treatment. But remember – pain should be the ONLY judgment of your condition. Increased pain my be due to an increase in localized blood flow, increased vascular activity, increased cellular activity, or a number of other effects. During more than twenty years of use of therapeutic lasers all over the world, very few side effects have ever been reported. Contrast that with the side effects of prescription drugs or surgery – laser therapy has an amazingly safe track record. A: Thanks to the higher power output of a Class IV Therapeutic Laser such as the K-Laser, treatment times are shortened, so you can get on with your busy life. Most treatments take only a few minutes. A: Obviously, all conditions are different. But as a guideline, most tendonitis cases require fewer than six treatments over two weeks, and the area has healed. Whereas chronic arthritic knee pain may require more treatments, along with an occasional ‘booster’ shot of laser therapy. Don’t want to come back for more laser therapy? Consider the alternative!!! Q: When will I feel better? A: Some patients feel improvement in their condition after the very first treatment. Sometimes you will not feel improvement for a number of treatments. This does not mean that nothing is happening. Each treatment is cumulative and results are often felt after 3 or 4 sessions. What health problems have shown benefits from Laser Therapy? Book an Appointment with Hargrave Chiropractic in Lafayette, LA. We are now taking new patients and gladly accept most insurance plans. Dr. Hargrave is the best and most knowledgeable chiropractor I’ve been too. Just tell him what’s wrong and he’ll have you as good as new in just a couple visits! No need to be scared to go to a chiropractor, he cares for his patients and wants nothing more than to make you feel better. If you’re in pain, do yourself a favor and go see Dr. Hargrave! After an unexpected minor injury that left me with significant lower back pain I called Dr. Hargrave asking for HELP! He was able to get me in right away! Dr. Hargrave took excellent care of me and had me out of the door and back at work much more comfortable! I was very impressed with his treatment and would recommend him to anyone in need of chiropractic care! Thanks again! I will be back, but no more falls lol!! !